This charming, giclée print and matching book let kids and grown-ups in on what the owl sees when the lights go out without pulling an all-nighter! 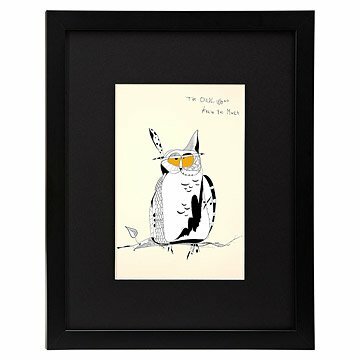 Give this night bird the spotlight in a bedroom, nursery, or playroom, or introduce him to Seth Anderson's other, quirky creatures to create a personalized sanctuary. All prints are fine art giclee prints printed and framed in Oregon. Made in the USA. Printed and framed in Oregon. Also available unframed. This is so cute. I purchased this for a relatively small wall in my Dining Room that is next to a small display cabinet. It is really cute. I could also imagine this going well in a child's bedroom or a small wall that needs a little brightening. This particular image is vertical. A few of the others (tiger & alligator) I purcased are horizontal. When I read the description on the website that was not clear to me originally. It's ok because I'm using the other 2 images on a different wall. This is framed well behind acrylic (looks like glass). The backing is cushioned so won't scratch the paint on your wall. Seth Anderson's The Owl Whoo Knew Too Much book tells a story about what a night owl sees while we're sleeping.